While many students at American River College started work at the beginning of the semester, the members of the theater department had been already working for months. Former stagework student and theater tech work major Kathy Smith said that the sets used in a play are beneficial because they relate to the characters. Smith said she has also gone far over the minimum 72 hours of lab time required for the Theater Arts 420 stagecraft course, completing 132 hours last semester. “Theater students know they’re going to live here for four to eight weeks,” said theater arts professor Kathy Burleson. The course is a six hour a week course, and students must complete 36 hours of lecture and 72 hours of lab work. 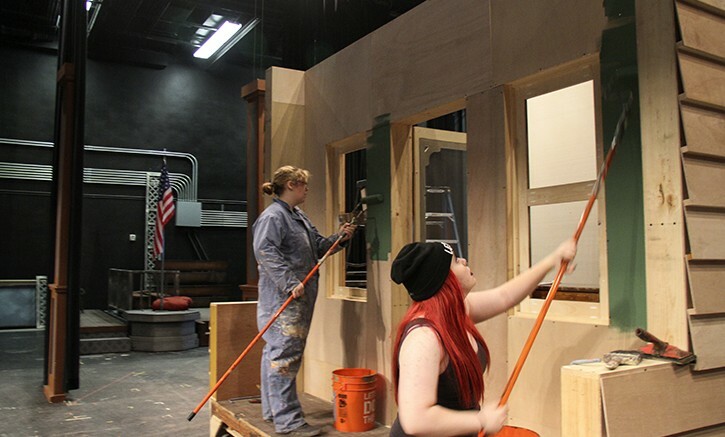 Students are enrolled in a stagecraft class, which also acts as a lab that is dedicated to the construction and theater props that are used by the theater department’s productions. Theater department employee and scenic painter for the sets of “Music Man” Amelia Holt said she likes that the jobs are given to students. Theater arts and technical major Melanie McClurg said that building sets as opposed to printing the scenes or having someone else build it is “ridiculously” more rewarding. Be the first to comment on "ARC theater students build the world of “Music Man”"